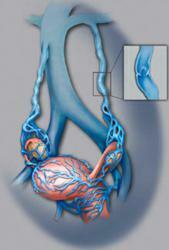 Pelvic Congestion Syndrome causes chronic pain in the pelvis and back. The procedure blocks off a diseased vein from the rest of the system, helping to reduce pressure and pain. The Heartland Vein and Vascular Institute in La Vista, Nebraska is providing information on how to relieve the symptoms of Pelvic Congestion Syndrome. This medical issue causes chronic pain in the pelvis and back, leaving many sufferers desperate for solutions. The vein center offers support and diagnostic tools for patients struggling with this painful syndrome. They are offering more information on treating this problem through Facebook, Twitter, and an informative video. Anyone dealing with Pelvic Congestion Syndrome is encouraged to get in touch with a vein doctor. Proper diagnosis and treatment will help ease the symptoms. Varicose veins and spider veins are extremely common in men and women. While spider veins are very small, reddish veins on the surface of the skin, varicose veins are much larger, bulging, tangled veins that may appear bluish in color. Men and women suffer from varicose veins, although women are much more likely to have them. Today, patients have access to a number of effective varicose vein treatment options. Advancements in technology and medicine have led to the development of effective, minimally invasive treatments that produce optimal results with few side-effects or downtime. These treatments include sclerotherapy, radio frequency ablation, phlebectomy, and endovenous laser ablation. The Heartland Vein and Vascular Institute is a leading vein treatment clinic in La Vista, NE. The center is dedicated to serving patients’ vein care needs with compassion and great results. The expert medical staff features vein specialists and knowledgeable technicians for added support. Special areas of expertise include varicose veins, spider veins, and deep vein thrombosis. Dr. Thomas Whittle, Medical Director, is a respected and experienced vein doctor who truly cares about his patients. The Heartland Vein and Vascular Institute offers the latest and most advanced techniques available to provide patients with a thorough assessment, diagnosis, and effective treatment for any type of venous disorder. Pelvic Congestion Syndrome is caused by varicose veins in the pelvic area.The vein center offers support and diagnostic tools for patients struggling with this painful syndrome.